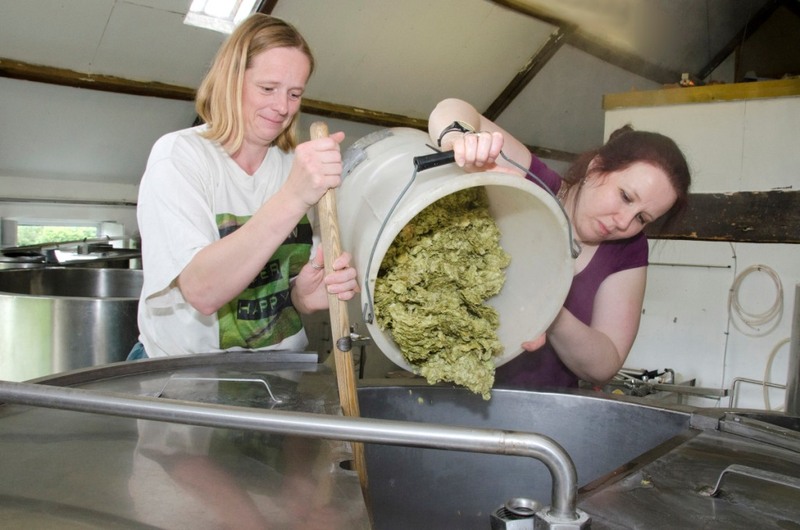 Sophie’s Beer Diary: Sommelier, making my own beer & beer on the radio! Pictures now added – see below. UK’s first female accredited beer sommelier! That’s me that is… No really, it is. Late last year I took myself on a couple of Beer Academy courses, one of which was How to Judge Beer. I wanted to see if I knew what I was doing when it came to tasting and writing about beer and was pleased to discover that I was on the right track. Then, while I was visiting Burton on Trent (which you can read about here: https://afemaleview.net/2012/03/28/more-beer-tourism-burton-upon-trent/) I got talking to the Beer Academy’s PR chap about their new sommelier accreditation and how, at the time, no women had applied to do the qualification and I couldn’t help but wonder…could I be the first woman to qualify under the scheme? So I went for it. I added the BA’s Advanced Course to my growing CV, worked on expanding my knowledge of beer and food matching and revised beer styles like crazy (by drinking them of course!). I asked people I’d helped explore beer to give me reviews and feedback on how I’d done, made sure my beer tasting notes were all in order and headed for London to sit my viva voce exam with the BA’s Chief Examiner Dr George Philliskirk. I’ve never sat an exam where 10 minutes in the examiner says “Right, let’s have a beer.” But a significant part of the exam was being asked to describe and explain the flavours and aromas of beers in a blind tasting and in some cases suggest food matches for them. And yes I did celebrate by going straight down the pub. 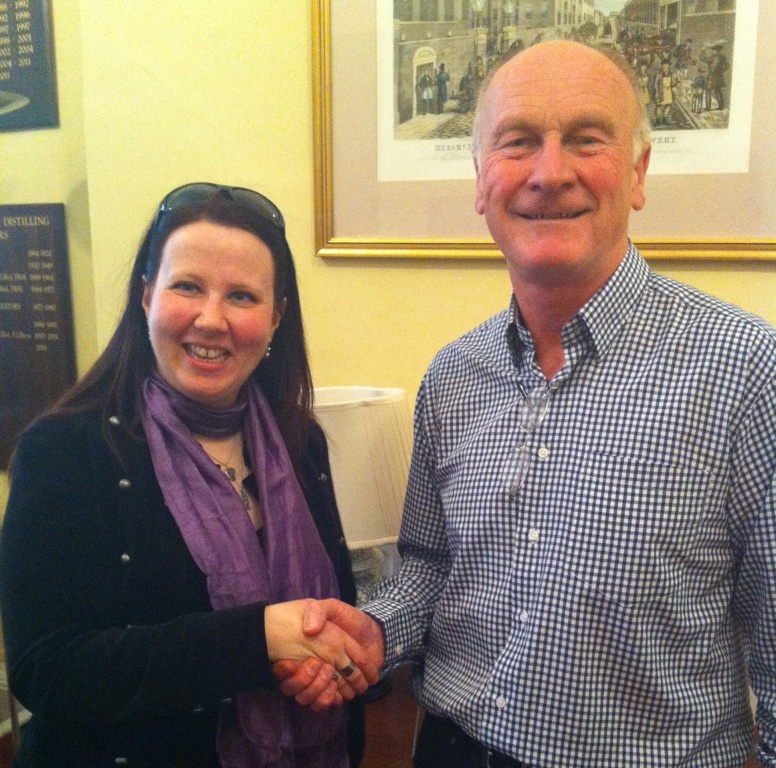 Shaking hands with Beer Academy Chief Examiner Dr George Philliskirk after I’d passed my exam. You can read a short description of what a beer sommelier is and find a link to the Beer Academy website on the ‘Beer Sommelier’ page of my blog. And then I made some beer. A few months ago the lovely Becky and John from Art Brew, near Bridport in Dorset invited me to Tucker’s Maltings Beer Festival (put on by SIBA South West) where they’d won a gold medal for their Monkey IPA (6.4%). We got talking about my sommelier training and they seemed quite impressed by all the things I’d learned about hops, malt and beer itself, since I interviewed them for one of my early paid pieces of beer writing. So impressed that they paid me the enormous compliment of inviting me to brew with them! In the weeks between the festival and our brew day last week we liaised on the recipe, talking and researching styles, considering hop and malt flavours and investigating the use of speciality yeast. We decided to make an English Saison/Dorset Farmhouse beer and then see if we could dry hop with a currently secret ingredient (which will be revealed when we launch the beer in a few weeks). So far so good. 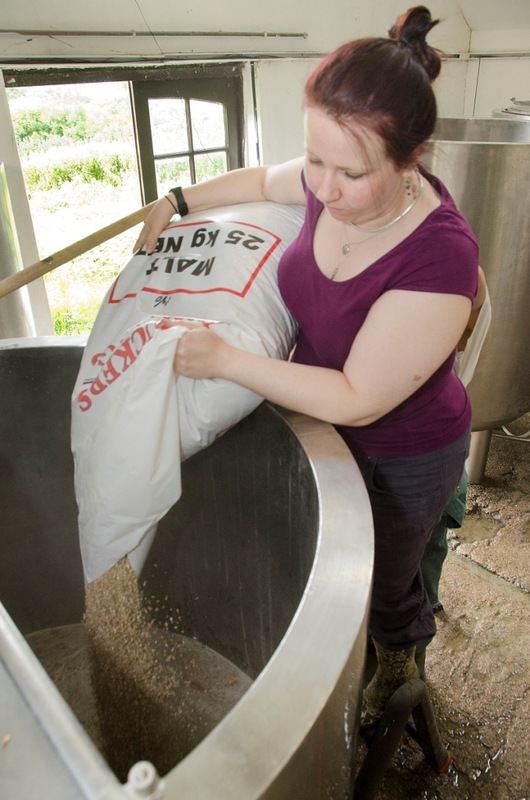 We hope to get Sophie’s Rustic Ale (4.7%) into casks within the next week or so and then hold a London launch event in August – details tbc but I will post info when/if we manage to arrange something. And as if all that wasn’t enough I’m going to be talking about my beer sommelier accreditation and doing a beer tasting live on BBC Radio 4 Woman’s Hour tomorrow (Friday 27th July). The programme is on between 10 & 11 am and R4 is at 92.4 FM and online, so listen in to see which beers I’ve chosen for the programme. Next The Great British Beer Festival! That’s brilliant Sophie! Well done, will listen on the iplayer listen again feature as I will be busy tomorrow morning, but I’m very much looking forward to hearing you. Congratulations, that’s great news and you must be chuffed to bits!